A celebration of the cultural heritage of the countries along the Silk Road, this book is a detailed, lavishly illustrated exploration of the ancient trade routes between Europe and Asia. 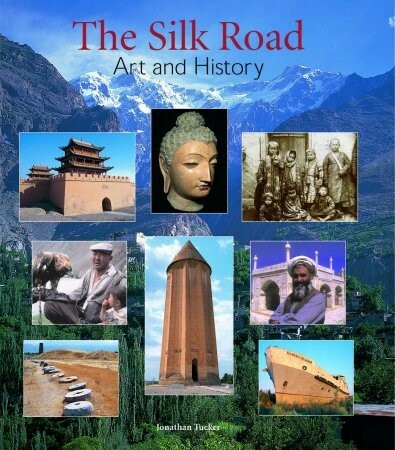 The author provides a comprehensive history of the Silk Road and examines many of the most celebrated works of art discovered in each country, setting them in their historical and geographical context. Drawing freely on anecdotes, and literary and historical sources, the author examines the lives of the merchants and other travellers who used the ancient routes and the ways in which their activities related to the works of art that were created. Vignettes and poems from the heyday of the great trading route punctuate a lively and colourful book, which also benefits from Antonia Tozer’s exceptionally evocative photographs of landscapes, monuments and peoples. in full colour, 29 detailed maps, clothbound, 314 x 270 mm. Emma C. Bunker, Research Consultant, Asian Art Department, Denver Art Museum. Asian Affairs (Journal of the Royal Society for Asian Affairs) Nov. 2003.